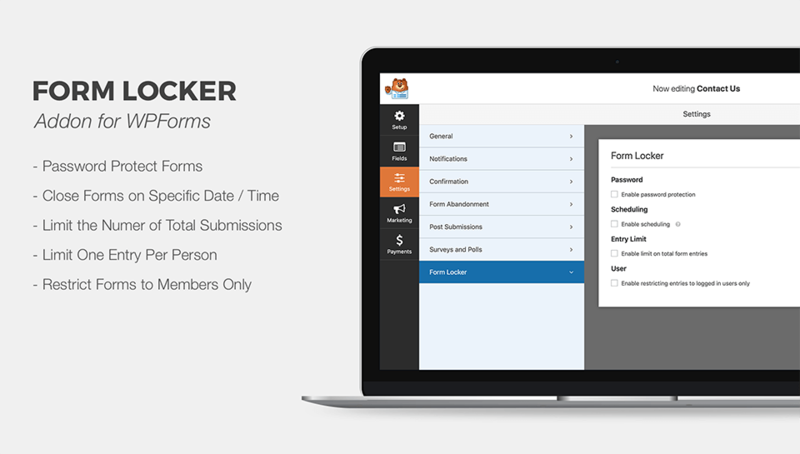 WPForms’ Form Locker addon allows you to lock your WordPress forms with various permissions and access control rules including passwords, members-only, specific date / time, max entry limit, and more. Do you need to manage permissions and have access control on your WordPress forms? WPForms Form Locker addon allows you to lock your WordPress forms with various permissions and access control rules, so you can control who can fill out forms on your website. Password Protect Forms – this requires users to enter a password to submit the form. This added protection helps decrease the number of unwanted form submission. Close Form Submissions After Specific Date / Time – this is great for any kind of application forms or other time-sensitive forms. Limit the number of total submissions – this is great for contests or giveaways. Once the max number of entries are in, the WPForms will automatically close the form. Limit one entry per person – if you want to avoid duplicate submissions, then you will love this option. This is very useful for scholarship applications, giveaways, etc. Restrict Forms to Members Only – you can restrict your forms to logged-in users of your WordPress site. This is great for membership sites or businesses who want to restrict support to paid customers only. If you are looking for a WordPress form plugin that comes with permissions and access control, then WPForms is the best option for you!